​We performed multiple interviews and shadowing sessions with Aplia customers. We also analyzed Cengage’s large library of textbooks and associated multimedia. We then worked with Aplia staff and customers through multiple wireframes and prototypes. Finally, our dedicated team of web developers and QA engineers worked directly with Aplia staff to build a scalable and highly interactive textbook experience that was tightly coupled to the Aplia homework system. Rather than reading full chapters and then completing online homework as we expected, students were taking homework problems and then scanning the portions of the chapters where they got problems wrong. While scanning, we noticed that distinct layout of pages in the print books enabled students to make “mental maps” that helped them find content quickly. To enable this behavior, we linked the homework problems directly to sections of the textbook chapters. We then designed a navigation system that allowed students to quickly scrub through thumbnails of the chapter pages. They could then click on any thumbnail to get quickly to a specific section. 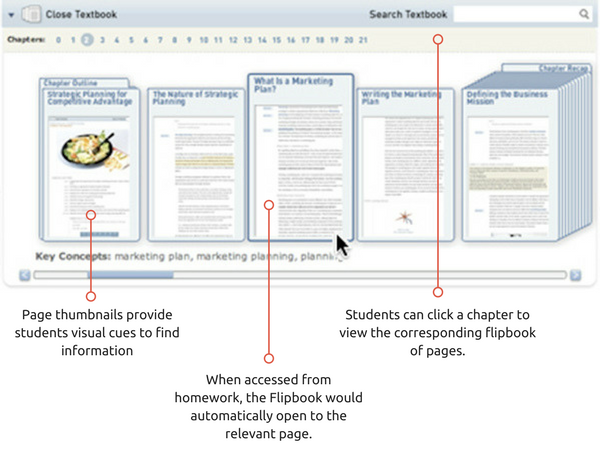 While working on a specific homework problem, students could click a Textbook link and the chapter thumbnails would automatically scrub to the appropriate page(s).